I'm not the kind of parent who's always carting kids to after-school classes. Tiny man does a whole lot of activities at nursery; afterwards, he's happy playing at home or out on an adventure with me and his brother. I don't think a packed timetable is a good way to grow up. But there's one class I do think is worth the effort and investment: swimming. It's not only a life-saving skill, it's fun exercise, it's hours of pool-play on holiday, it's an amazing feeling to love the water. Swimming lessons are a ticket to a love of one of the best activities there is - and one you can do solo, at any age, and for as long as you like. But when I think back to my swimming lessons as a kid, I think, ugh. I only got in the pool due to the promise of Pom-Bears afterwards. Lessons meant hanging to the side by your fingertips, waiting your turn to splash around and be told what to do by a teacher on dry land. 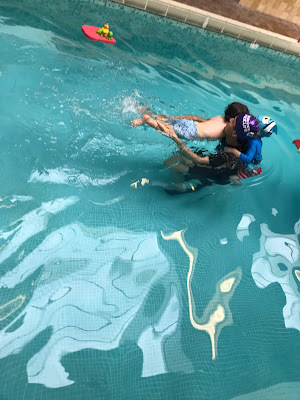 So when I saw my "initially hesitant" (read: screaming I'M NOT GOING SWIMMING for the whole previous hour) toddler shrieking with joy as his Swimming Nature teacher, Vilmar, poured water over his head and got him water-confident, I thought: this is a really special kind of swimming lesson. The gist of Swimming Nature is getting people on the path to the life-saving skill of swimming the fun way. 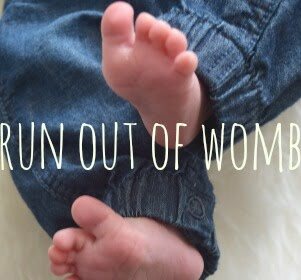 There's no arm bands, no doggy paddle; toddler-age classes are one-to-one or, at a maximum, one-to-two. 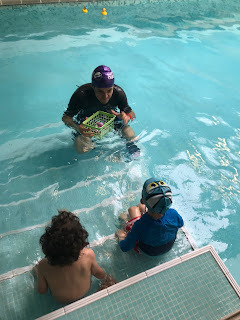 The teachers are always in the water, never yelling instructions from the pool-side; eventually they teach the correct mechanics of the four recognised strokes, but obviously at toddler age, it starts simpler. And so to the happy shrieking: Vilmar really 'gets' kids. Within two minutes he'd clocked that Tiny Man is a transport-loving toddler; he'd filled a watering can up with 'petrol' (pool water, obvs) and was pouring it over his head (the same head that goes bananas if a single drop of H20 hits his face on hairwashing night). Tiny Man was powerfully kicking his way to the other side of the pool because he wasn't swimming, duh, he was a speedy car, fuelled-up and racing along. Swimming Nature isn't cheap: the tiny ratios and top-notch pools ensure that. But at times as I watched Vilmar simultaneously teach two three-year-olds to be happy in the water whilst overcoming their various neuroses (one hated goggles, one didn't like his feet touching the wall, just your average toddler chat..) AND keep them both afloat (one on each arm, or one hanging on the back, etc) without arm bands or floats, I thought, whatever he's paid, it isn't enough. This is one skillful job. Another thing that impressed me was the setting: we swam at Swimming Nature's private pool in Muswell Hill, north London; it was scrupulously clean (and almost continuously mopped by a conscientious on-site mopper! ); there's loads of poolside toys and equipments, and there were also toys and books to occupy siblings waiting out of the pool. Training-wise, all of Swimming Nature's teachers hold ASA (Amateur Swimming Association) or STA (Swimming Teachers’ Association) qualifications and have life-saving qualifications and a CRB Enhanced Disclosure. Final evidence for how much I rate Vilmar and Swimming Nature's lessons is this: we were gifted three classes for this review piece. I thought, 'wow this is good - but it's £30 for each half-hour lesson - is it worth it?' We're signing up for a term - if there's a skill worth investing in, it's definitely swimming and Swimming Nature make it fun.